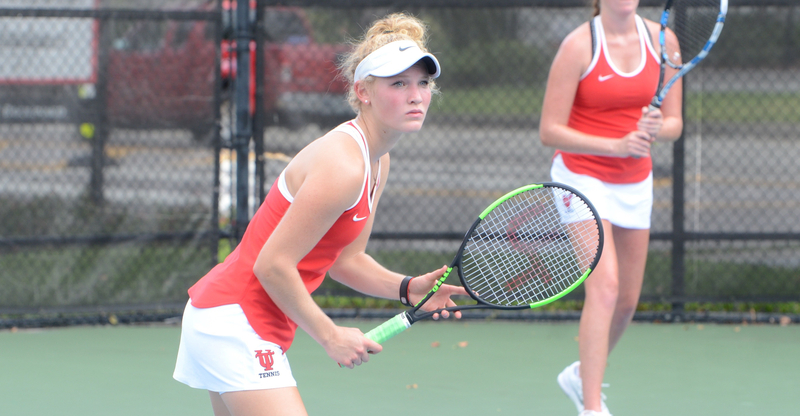 The tennis team will look to be competitive once again this Spring season. The Spartans were victorious in their first match of the year at home against the State College of Florida (SCF), winning eight of the nine matches. Last season, the Spartans finished with a solid 8-8 record, ranking as high as no. 35 in the nation. They made it to the conference playoffs, falling to no. 2, Lynn University, in the opening round of the 2017 Sunshine State Conference Championships, losing all five matches on the day. Maddie Stephens led the way with 13 singles wins in 2017 as the sophomore finished 13-5 overall. Stephens also ranks no. 14 in school history with 24 career singles wins. Stephens will look to improve upon her performance this year, her junior year. Head coach of the women’s tennis team, Al Dufaux is expecting to be competitive once again this season. Dufaux, even with a strong team, still has some worries going into the new season. “The same thing concerns me as it does all coaches – everyone staying healthy. We already have one player with a shoulder injury, so that impacts our starting lineup,” Dufaux said. The Spartans did not have any seniors on the roster last year, which means they did not lose any of the players from a year ago. Instead, the Spartans added even more players to the roster. Hewland, in her fourth year at UT, will look to have her best season yet. Last year, she played in a total of 18 matches, finishing with a 3-15 singles record and a 9-10 doubles record with partner junior Caroline Lozo. Hewland spent the entire season as the no. 2 singles player and no. 1 doubles duo with Lozo. For her final season, Hewland has laid out a few goals she would like to achieve before her time is up playing for UT. The Spartans will be fighting for another conference berth this year. With all of the players returning from last year, as well as three new players, the Spartans will look to push further than a first-round exit in the tournament. Hewland had some encouraging words for the incoming players. “My advice to the incoming players would just be to work hard and enjoy the time you have playing tennis here, it goes by so quickly and it really will be a great experience and a great team to be a part of,” Hewland said.